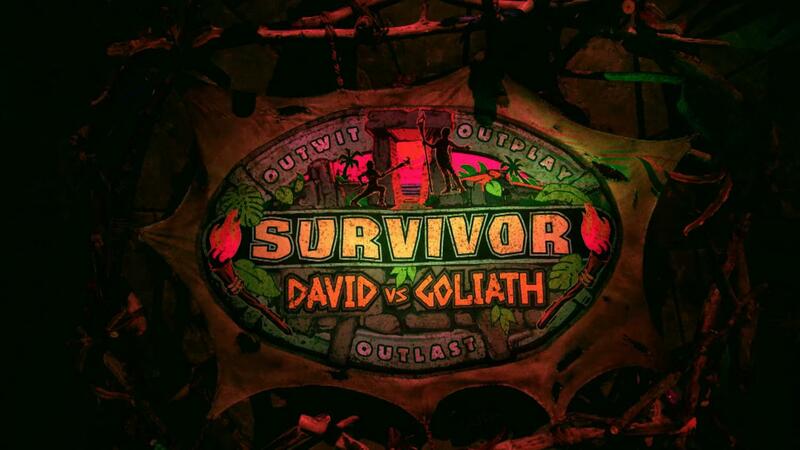 The Survivor banner highlights competition and challenge between the two teams of David and Goliath. This week’s episode of Survivor was single handedly one of the craziest I’ve ever seen! Tribal lines were crossed and crazy moves were made. During last weeks tribal council, Elizabeth (David) was voted off. Angelina (Goliath) had some major explaining to do. During the previous tribal council, Elizabeth was able to avert suspicions on Angelina by making a huge statement at tribal council. Even though Elizabeth went home, the rest of the tribe was now consciously aware of Angelina’s shenanigans. Many tribe mates are now looking to vote her off the island. At camp, members of the David tribe, Nick, Carl, and Davie discover the “steal a vote” advantage. This means that they can take anyone’s vote away in the tribe and use it for their own personal gain. The challenge was a real tough one this week. The unified tribe was split into two teams and had to hold ten pound sand bags over their heads. After fifteen minutes one person must drop out and give their sandbag to someone else. The reward was my own personal favorite, pizza. After the reward, some of the tribe members brainstorm ideas on who to vote off. They chose Christian. A scrawny nerd whose easily the smartest and most likable person in the game from team David. The tribe is divided because a lot of David’s are allied with him and like him. Nick is prepared to use his steal a vote until Davie reveals an important piece of info. He has an immunity idol, and so does Dan (Goliath). Those are used to grant someone immunity during tribal council. A plan is set into action. At tribal council, the majority of the David’s vote for Angelina and the Goliaths vote for Christian. Davie plays his immunity idol for Christian, which pressures Dan to play his idol for Angelina, which he does. Then the secret plan is revealed. Christian, Nick, and Davie vote for John (Goliath)! It was a huge blind side that no one saw it coming. A Goliath goes home and the David’s are one step closer to regaining majority.